Handle the produce carefully and gently to avoid damage (cuts, bruises and squashing). Frequently remove damaged or diseased produce. Keep the produce at an adequate and constant temperature. 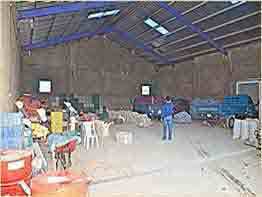 There are countless types of handling facilities. On this page we will highlight several of the typical facilities for handling onions, potatoes and other produce. However, before going directly to the facilities in operation, we will show you how they are set up, starting with the arrival of the containers with all of the equipment, control panel and cables at a grower's compound. Installing an Eqraft, BV postharvest facility for potatoes, onions and carrots. We recommend reading our article on installing a postharvest facility for potatoes, onions and carrots, with an input capacity of 25 tonnes. Once you have read this article, you will have a much better idea of agricultural mechanisation. Read the article here: Installation. Read the article here: installation postharvest handling line. The facility receives the harvested produce by hand in 40-50 kg sacks. To begin with, the produce is separated from any unwanted elements, such as clods and stones, and may then be brushed. Afterwards, it is placed into storage boxes. This facility can receive the product from the storage facility, passing through an inspection table, grading machine, and packing area. Read the article here: facility for receiving and handling. .
From that point on, this facility has been working day in, day out. This type of line is found all over the world, on large farms, at food markets, stockpiles, and supermarket distribution centres. These lines not only improve the appearance of the produce, but also add key value through grading and packaging. Click to see a facility for washing and packing potatoes. . This unit is particularly useful in countries where onion storage is unnecessary because most onions go straight to market, such as Mexico, Argentina and India. This facility consists of a receiver, a topper, an inspection table, a grading machine and four rotary turntables for packing the produce. The whole unit has a capacity of 12 to 15 tonnes per hour, and is mounted on a trailer with its own generator and workstation, making it fully automated and capable of processing all of the harvest all year round. Click here to see: Mobile unit for harvesting and handling onions in the field. . 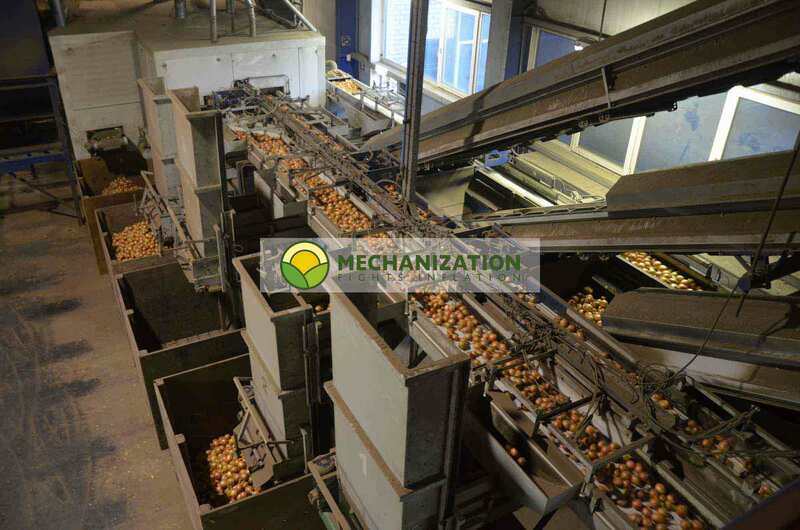 This line receives and pre-washes onions, then grades them into 6 sizes with a grading conveyor. From here, the produce passes through six inspection tables and then six semi-automatic weighing and packing machines. 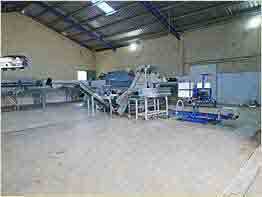 Click here to see: Facility for grading and packing onions, capacity 30 tonnes per hour..
3. To substitute part of the labour costs for financing costs, which are not susceptible to inflation. In other words: inflation increases labour costs over the years, and decreases financing costs. Later on, we will demonstrate four landmark postharvest handling facilities, which add value to produce immediately after the harvest. Click on the boxes above to see these facilities up close (with explanations, photos and videos), and a few financial examples of how mechanisation affects the general costs of the handling processes.